Instead, I relied on garlic, Coconut Bacon, and red pepper flake. Coconut sugar brings balance to the dish, while lemon juice is the perfect finishing touch for a bit of acidity and brightness. These veganized Southern-style collard greens would make the perfect side dish to mains like my Best Vegan Pulled ‘Pork’ Sandwich, Sweet Potato Black Bean Burger, or Vegan Sloppy Joes. Or pair it with BBQ Jackfruit Sandwich and Best Vegan Gluten-Free Cornbread for the ultimate comfort meal. For more collard green recipes, check out my Coconut Curried Greens and Collard Green Spring Rolls with Sunbutter Dipping Sauce! Last but not least, if you try this recipe, let us know! Leave a comment, rate it, and tag a photo #minimalistbaker on Instagram so we can see what you come up with. Cheers, friends! 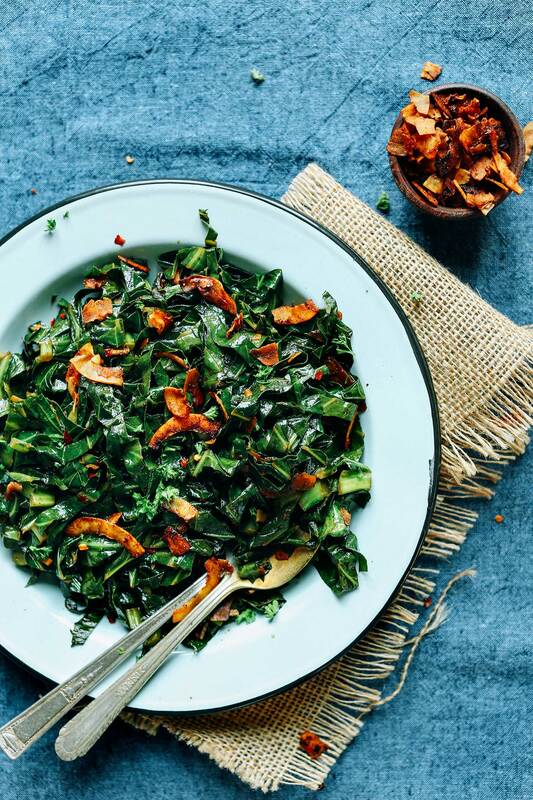 Easy 15-minute, 1-pan collard greens with coconut bacon for a smoky, crispy crunch! A delicious, healthy, plant-based side dish or snack. Heat a large metal or cast-iron (my preferred) skillet over medium heat. Once hot, add coconut oil and garlic and sauté for 1-2 minutes, stirring frequently, until fragrant and very slightly golden brown. Add collard greens and a pinch each salt and pepper and stir. Sauté for 3-4 minutes, covered, stirring occasionally until bright green in color and slightly soft. Add coconut bacon, vegetable broth (start with lesser end of range- 3 Tbsp or 45 ml as original recipe is written), a bit more salt and pepper, coconut sugar (start with lesser end of range- 1 tsp as original recipe is written), and red pepper flake. Stir, cover, and reduce heat to low. Simmer for 4-6 minutes, stirring occasionally. Continue cooking to desired tenderness. I like mine with a little crunch left, so I leave the vegetable broth at 3-4 Tbsp (amount as original recipe is written // adjust if altering batch size), but you could continue adding vegetable broth (up to 6 Tbsp // amount as original recipe is written // adjust if altering batch size) and simmer up to 15 minutes for more tender collards. Taste and adjust seasonings as needed, adding more coconut sugar for sweetness / flavor balance, salt and pepper for overall flavor, red pepper flake for heat, or more coconut bacon for smokiness and crunch. Serve immediately with additional coconut bacon and a squeeze of lemon juice (optional). Best when fresh, though leftovers keep in the refrigerator for up to 3 days. Reheat in the microwave or a skillet over medium heat until warmed through. *If you can't find collard greens, curly kale will work in this recipe as well. Just reduce cooking time by a few minutes, as it typically requires less time to become tender. *Nutrition information is a rough estimate calculated with coconut bacon. Perfect!! I had leftover baby Bok Choi so I mixed those with some greens. Recipe is easy, flavorful and very satisfying! I will definitely prepare again. Have you or anyone made this without sugar? I made this last night, Dana, and although it took me forever to prepare the collards, I wish I had made twice as much because I can’t stop eating it! Thank you for the recipe! Dana? I love this recipe! Made it this week. Coconut bacon is amazing. I love your blog! Just went and purchased your book. I have a request- could you put your other recipes in a book? I am enjoying so much and I like to flip through a book and follow instructions- more so than trying to remember where I found it on the net! Haha. I truly appreciate your blog and beautiful pictures. My carnavore family liked the bacon too! I’ll show them the beauty of a high vegetable diet yet? Would date sugar work instead of coconut sugar? Hi Laura! We haven’t tried but I think that should work! I had never had collard greens before but just got some from my CSA so decided to give this a try. Just wanted to say i was amazed by how much i loved this. I did use extra coconut bacon but other then that followed the recipie exactly. Loved it. Sounds good except for the oil and sugar. Can they be left out? after my fiasco with the curry dish I decided to buy one batch of collard greens. This was so delicious. I forgot to buy coconut for the bacon; had some vegan bacon that I used. and I put a 1/4 tsp of smoked paprika in the mix. I could of eaten the whole thing, but didn’t. This is a keeper. Thank you so much. 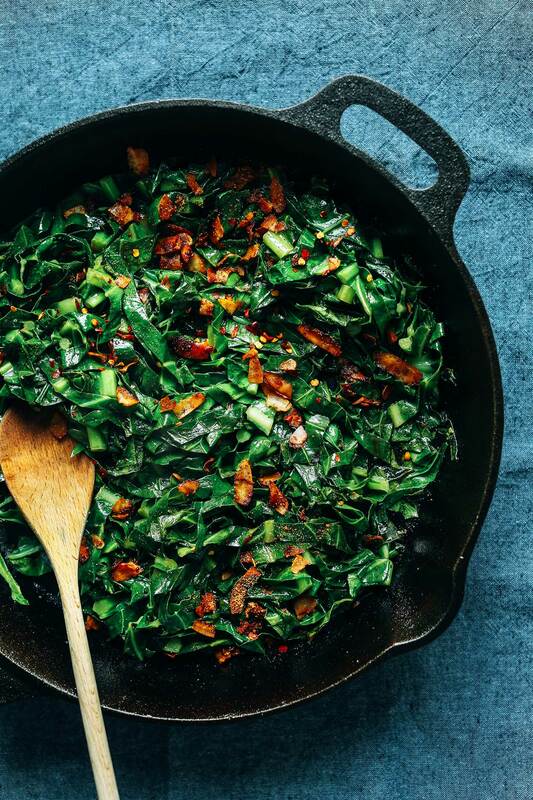 I love collard greens, and this looks great! But, I just want to say that your coconut bacon and eggplant recipes are both killllller!! Loving them both! These look delicious! 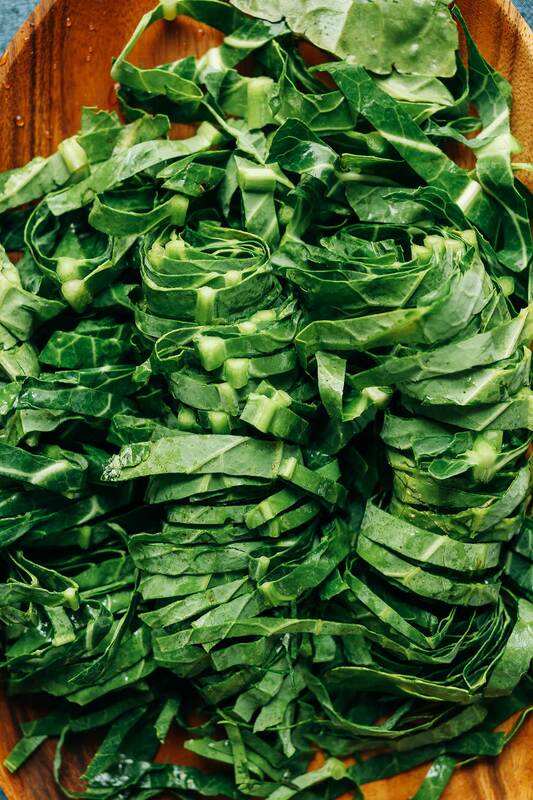 I’m totally new to collard greens–but they’ve been on my “to try” list. Do you also use them raw in salads or smoothies, or do you think they’re best cooked like in this dish? They are! Must be something going on with your browser? Make sure it’s up to date! Hi Tanya! If you scroll down on the page, you’ll find a menu of social icons! All of the recipe images are pinnable by just clicking the Pinterest icon. Hope this helps! Can I substitute garlic infused oil for the garlic with good results? Of course! Are you low FODMAP or just don’t like the texture? I’m so happy finding your page! So inspiring! I have been hoping I would find this recipe! Thank you. By the way, I was always told to hand rip the greens to avoid bitterness. I am going to try this tonight!!! So you’re saying that these are not slimy? 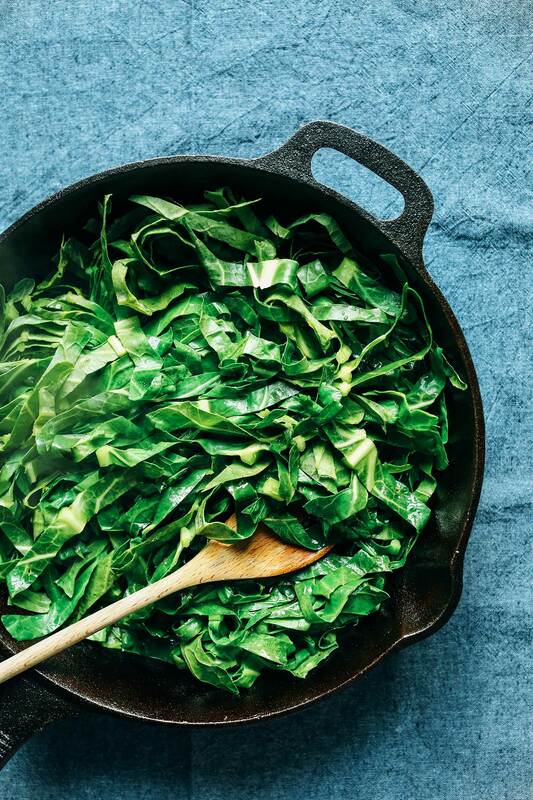 I grew up in the south, but girl, those collards just never did tempt me because I have a texture thing, and slimy greens just don’t feel good on the tongue. I’m eager to try collards, but not if they are just going to disappoint me. How do you keep them from getting slimy? Nope! They really aren’t! I think not adding much fat (traditionally from pork) helps. In addition, they are cooked less in more of a sauté/steam situation rather than boiling. Hope that helps! Where do you find large coconut flakes? Your local grocery store should carry them! Melt my heart this looks incredible. I’m a sucker for anything with bacon and I am so excited to try this out! I don’t even know what collard greens are but this looks delicious. Does anyone know if this recipe would help with weight loss? I’ve been trying to find foods that will help boost my metabolism. I was on another blog and there was a link that offered info about foods and recipes that get your metabolism charged up. Ooo I LOVE collard greens! I like that your recipes are simple and quick :) No fuss is the way to go!